Today, Lottie Day shares on of her most popular handmade items and I can see why they are! I’m a Norfolk based artist and textile designer. I produce a range of hand-printed, hand-made products for use in the home, garden or at the beach. My work is based on my line-drawn illustrations, which are screen printed onto canvas and adapted into products such as shopping bags, napkins and even double deck chairs! What about the napkins you are sharing with us? 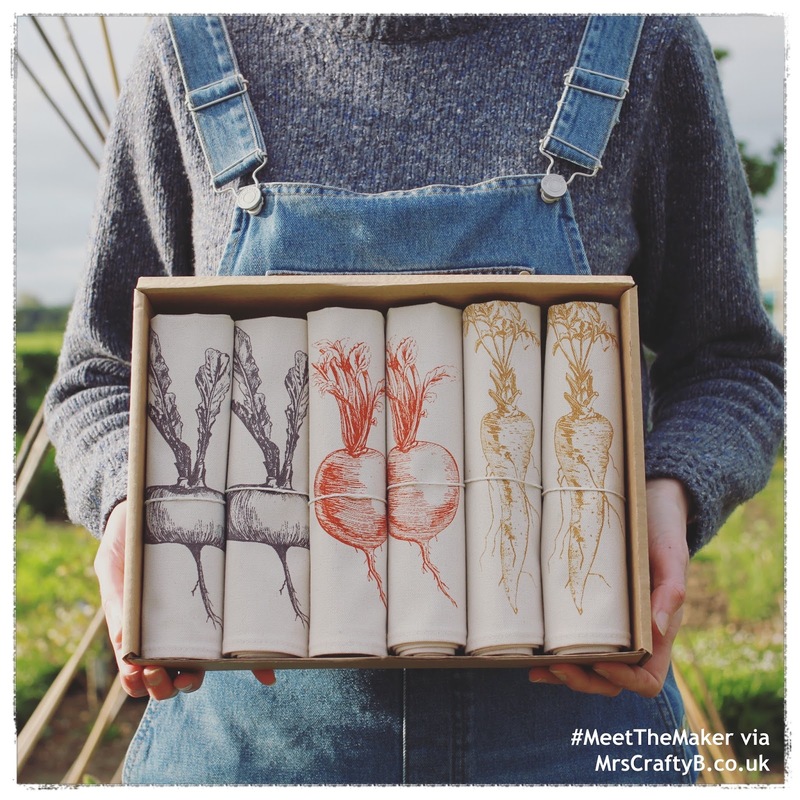 My Allotment Napkins are definitely my most popular product. They feature illustrations of Turnips, Swedes and Parsnips. I’m always helping my Dad on his allotment and the things he digs up provide a constant source of inspiration. They are fab. I especially like the colours. So when did you decide to turn your creative skills into a business? After finishing University in Falmouth, I started up my own gallery and shop in Norwich. It was really inspiring to interact with artists and makers but it also made me realise that I'd stopped being creative myself! So I bought a sketchbook and started drawing again. I taught myself to screen print, it gave me the power to adapt my illustrations into all kinds of exciting creations. Before I knew it I was selling at craft and design fairs and getting orders from the USA. It is so easy to get lost in others creativity. I am glad you rediscovered yours! Tell us what inspires and motivates you? The Norfolk countryside absolutely influences my work, the majority of my illustrations are based on plants or animals that I’ve spotted around the county. Screen printing is a very satisfying process, it’s almost addictive! I need very little motivation to get working, I’m most comfortable when I’m in the studio. I get a great sense of the countryside from your work and I love that your illustrations translate that into home decor items. Where can we find you online? Have you been to The Handmade Fair before? This will be my second time, I had a really brilliant time last year, the standard of work is so high. I’d definitely recommend booking up a workshop or two, you can come home with a new skill! I can't wait to do some workshops! What are you most looking forward to this year? Spending all my profits on the other stalls! And eating cake. I am totally with you on the cake! What will visitors find at your stand and where will we find you? Last year I had a lot of requests for printed fabric, so I’ll be putting together some special designs for budding seamstresses! I will be at stand W98. Oooo interesting. I will be sure to stop by to check them out! What will you be up to between now and The Handmade Fair? Printing and sewing like a woman possessed! Haha. I look forward to meeting you Lottie. Ok a quick fire round! Lucy Elisabeth, The English Stamp Company and Gabrielle Vary. I love The English Stamp Company. What is your favourite handmade item? I love automata! Works of art that move when your turn a handle, I recently bought some beautiful little pieces by L & A St. Leger. A great excuse to eat cake. That is my favourite answer so far and I am definitely going to have to start a cake fund in preparation! Thanks so much Lottie for featuring your napkins on #MeetTheMaker.